Recently I was doing one of Kendra Little’s (b/t) SQL Server quizzes. 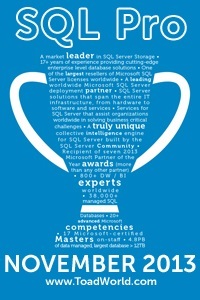 Specifically the Quiz: COUNT() in SQL Server. As always I enjoy these quizzes and in this particular case it gave me an idea for a post. How do NULL values affect the COUNT function? Here we get the number of DISTINCT non NULL values. Using the same list of values, (1, NULL, 1, 2, 3, NULL, 1), this time you’ll get 3. Really this is the same as the regular COUNT (warnings, nulls etc) with the one exception that, currently at least, you can’t use windowing functions with COUNT DISTINCT. ANSI_NULLS does not appear to have any effect on COUNT. SELECT COUNT(1/NULL) FROM TableName; –Returns 0 (zero). SELECT COUNT(NULL) TableName; –Returns 0 (zero). Presumably because it returns a set of NULLs and then does the count of the set of nulls it created..
Just a curious result and another reason to dislike NULLs. I honestly don’t mind NULLs that much. They server a necessary function. They are just somewhat tricky to follow :).